Use the Database Properties section in the TeamDesk Setup mode to modify a database name, upload a logo set a language, location and time zone. To edit database information, click the Edit button. 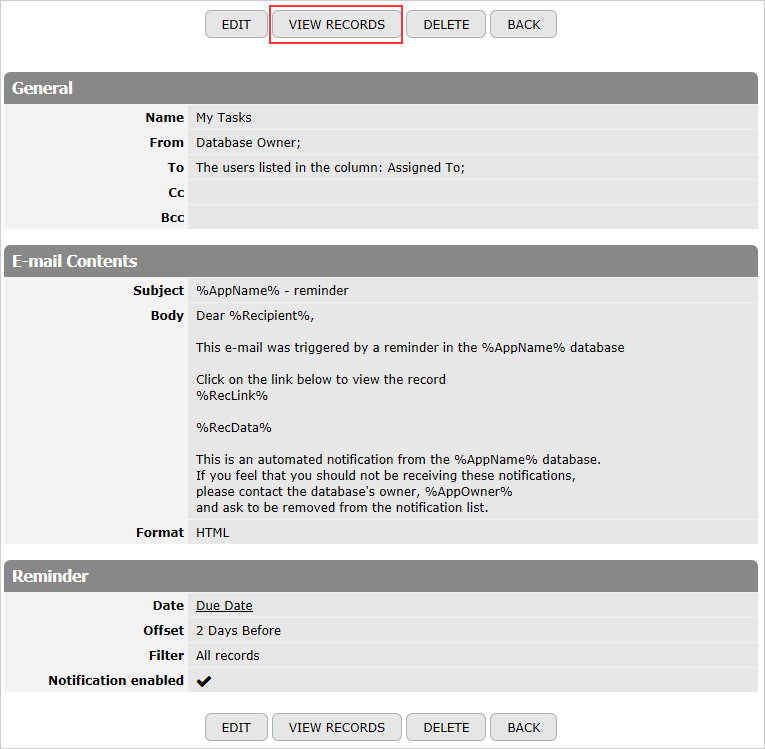 In the appeared form edit the general options like a database name, a description and upload a logo. To display your own logo in the left corner of the database, click on the Choose File button and select an image file on your computer (Note: Your logo will be visible only in the database user mode). Sometimes the logo and the database name are duplicates or do not look well balanced. In this case you can check the Hide database name option and the database name will be hidden. Please note, that the system tries to adapt the logo image size proportionately to 300x100 pixels. If it is not possible to resize the image, the system uses the proportions of your image and displays it in size 300x100 pixels. Administrators can set the Language and Location and Time Zone properties. These properties parse and specify the numbers, dates and time format that are used instead of the current user settings. The chosen format will be shown for public users or other persons who have not their own TeamDesk accounts. For example, you work with the Sport Club database and notify registered course members who are not TeamDesk users about changes in the schedule of the Aikido workshop that will take place in Japan. You can set corresponding Language and Location and Time Zone. As a result the date and time format of such notifications will be displayed according to Japanese (Japan) Language and Location and (UTC+9:00) Osaka Time Zone. In case you create formulas, there are the Workday and Workdays functions that include the weekends argument. If this argument is omitted, the Weekends option (Saturday, Sunday is the default) acts as the default weekends argument. The Extras section and the Support Staff Access option. The support team does not have access to your database by default, except free trials. Therefore, if you need help from the Support Team members, you can provide the access to the database via the Support Staff Access option. It allows you to grant access to members of TeamDesk support team until 23:59:59 of a certain date in database-specific time zone – or deny it.